Walter Clyde "Puggy" Pearson died on Wednesday at the age of 77. One of the old-school colorful characters of the game, Puggy is credited for first introducing the "Freeze-Out" style of tournament play. He brought the idea to Nick the Greek, who brought it to Benny Binion. The rest, as they say, is history. 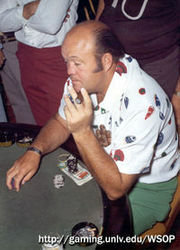 Puggy, who got the nickname from a childhood accident that fucked up his nose, was one of the seven people invited by Benny Binion to participate in the first World Series of Poker. Puggy won the Main Event in 1973, has three total WSOP bracelets, and was elected into the Poker Hall of Fame in 1987. "…ruled Las Vegas when it was just emerging as the poker mecca." "Puggy made millions the old-fashioned way – at the tables. He probably never collected a dime that he didn‚Äôt have to hustle out of someone who was trying to hustle him right back, but I don‚Äôt think he would want it any other way. Sure, Puggy now plays ‚Äúcheap poker,‚Äù as he calls it, but there‚Äôs no shame in that for a man in his late 70s. Puggy owns a couple of Johnny Moss‚Äôs old World Series bracelets, so he‚Äôs seen first-hand the cost of letting pride get the better of common sense." Get a copy of the book and give it a read . “I’ll play any man from any land any game that he can name for any amount that I can count . . . providing I like it.” – Puggy Pearson. RIP Puggy. Thanks for paving the way.